I'll be the first to admit that meeting new people at events can be kind of awkward if you're not super social. As an introvert, I really have to make an effort to meet new people and engage in conversations with strangers at events, but it's always worth it because I leave knowing a new person! Talking to new people can be difficult at first, but I've found that being prepared to talk to strangers makes things 100x easier. If the conversation doesn't naturally start or carry on, I always have some questions in mind to spark conversation and hopefully make some connections with the person. The key to asking questions is to also listen to the answers - that's how you can make a great response and potentially make connections! 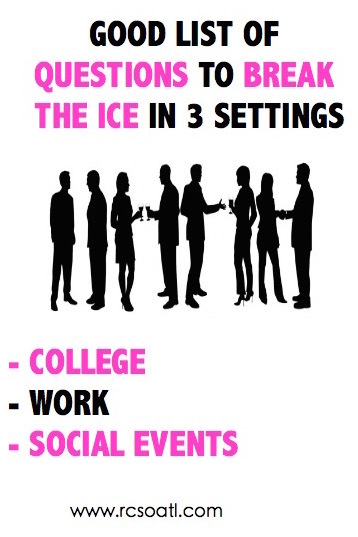 So here are some of the questions and conversation starters I use in three different settings: college settings, work settings, and random social events in Atlanta. I hope these are helpful for you! What made you decide to attend *insert college name here*? Do you work or have an internship? What career do you plan to have? Where are some good lunch spots? How many people are in your department / on your team? What area/part of town do you live in? Where did you get your *insert clothing item here* from? Do you have a go-to conversation starting question or statement? Please share in a comment below! these are really great ideas! thanks for sharing them! These are all such great questions to ask to get a conversation rolling! These are great and can totally be applied to a variety of social situations. Plus you never know the connections you can make from starting up a conversation with someone! I've never been one for networking, but these are helpful hints! I wish I had of learned this way earlier in my career, but networking really is key to navigating the career world.